Axin, a negative regulator of the Wnt signaling pathway, contains a canonical regulator of G protein signaling (RGS) core domain. Herein, we demonstrate both in vitro and in cells that this domain interacts with the α subunit of the heterotrimeric G protein G12 but not with the closely related Gα13 or with several other heterotrimeric G proteins. Axin preferentially binds the activated form of Gα12, a behavior consistent with other RGS proteins. However, unlike other RGS proteins, that of axin (axinRGS) does not affect intrinsic GTP hydrolysis by Gα12. Despite its inability to act as a GTPase-activating protein, we demonstrate that in cells, axinRGS can compete for Gα12 binding with the RGS domain of p115RhoGEF, a known G12-interacting protein that links G12 signaling to activation of the small G protein Rho. Moreover, ectopic expression of axinRGS specifically inhibits Gα12-directed activation of the Rho pathway in MDA-MB 231 breast cancer cells. 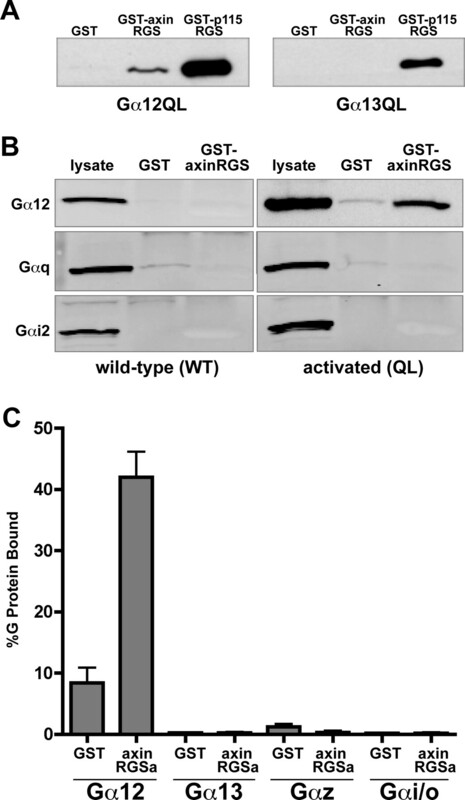 These findings establish that the RGS domain of axin is able to directly interact with the α subunit of heterotrimeric G protein G12 and provide a unique tool to interdict Gα12-mediated signaling processes. Heterotrimeric GTP-binding regulatory proteins (G proteins) stimulate a wide variety of cellular signals as a result of their interactions with G protein coupled receptors (GPCRs). Upon ligand binding by a GPCR, the intracellular portion of the GPCR engages and induces a conformational change in the α subunit of the G protein, causing it to release natively bound GDP and bind GTP (Cabrera-Vera et al., 2003). The newly activated GTP-bound α subunit then dissociates from the βγ subunit, and both molecules subsequently interact with downstream effectors to trigger a variety of cellular events. G protein signaling is terminated when GTP is hydrolyzed to GDP. Although Gα subunits possess an intrinsic GTPase activity of their own, a family of proteins called regulators of G protein signaling (RGS) has been shown to interact with activated Gα subunits and greatly enhance GTP hydrolysis (Berman et al., 1996; Hunt et al., 1996; Watson et al., 1996). RGS proteins are defined by a conserved ∼120-residue domain termed the “RGS box” (Siderovski et al., 1996). This region binds with high affinity to the transition state of Gα subunits, lowering the energy required for GTP hydrolysis to occur (Ross and Wilkie, 2000). In addition to their GTPase-stimulating activities, some RGS proteins act as scaffolding molecules that hold signaling complexes together. So far, more than 30 mammalian RGS or RGS-like family members have been described and are divided into six subfamilies based on identifiable domains (Hollinger and Hepler, 2002). One subfamily of RGS proteins, the primary member of which is a protein termed axin, contains multiple domains that facilitate its critical role in the Wnt pathway (Zeng et al., 1997). In this pathway, axin acts as a scaffolding protein holding together a signaling complex involved in the break-down of β-catenin, the primary target of the canonical Wnt signaling pathway. Wnts are secreted glycoproteins that bind to the Frizzled (Fz) family of seven transmembrane-spanning receptors (Nelson and Nusse, 2004). In the absence of Wnt ligand, cytosolic β-catenin is bound to a complex of proteins including axin, adenomatous polyposis coli (APC), and glycogen synthase kinase 3β, where it becomes phosphorylated, ubiquitinated, and directed to the proteosome for degradation. The integrity of the β-catenin destruction complex is dependent, in large part, on an interaction between axin and APC (Munemitsu et al., 1995; Spink et al., 2000; Rubinfeld et al., 2001; Choi et al., 2004). Mutations in the APC gene are prevalent in cancers, especially in the colon, and often involve truncations in the region of APC that interacts with axin (Munemitsu et al., 1995; Korinek et al., 1997). In the presence of a Wnt signal, the β-catenin destruction complex dissociates and β-catenin accumulates in the cytosol, eventually reaching levels high enough to enter the nucleus. Once inside the nucleus, it acts as a transcriptional coactivator with members of the lymphoid enhancer factor/T cell factor family of transcription factors and activates genes important in cell growth and development (Nelson and Nusse, 2004). The RGS domain of axin is the site on this protein at which binding of APC occurs. A cocrystal structure of the RGS domain of axin with the axin-binding domain of APC has confirmed that the axin RGS domain is structurally very similar to other RGS proteins with confirmed G protein binding capacity (Spink et al., 2000). However, binding of APC used a face of the RGS domain distinct from that used for Gα binding by other RGS proteins (Spink et al., 2000). The first description of an interaction between axin and a Gα subunit—Gαs—has recently been reported (Castellone et al., 2005). Here we report that the RGS domain of axin also directly interacts with the α subunit of G12 in an activation-sensitive manner. 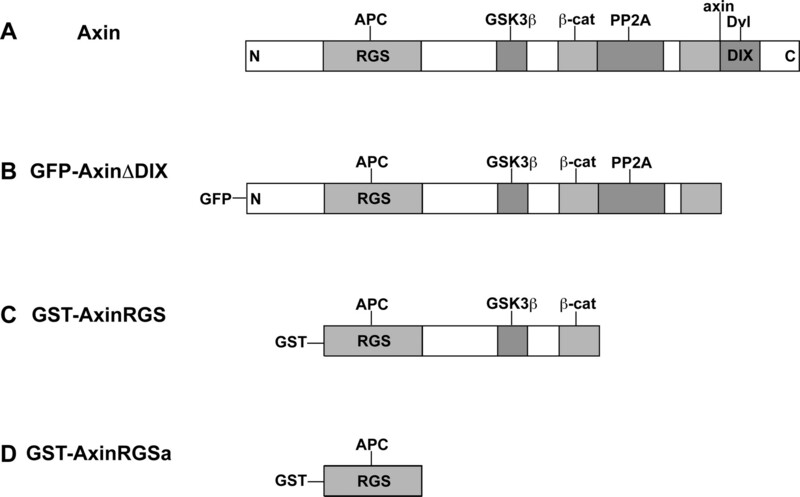 Biochemical analysis comparing the axin RGS to the RGS domain of a known G12 effector, p115RhoGEF, suggests that Gα12 binds axinRGS and p115RGS in a mutually exclusive fashion. Although axinRGS did not significantly accelerate GTP hydrolysis during in vitro GTPase activity assays, it did specifically prevent G12-activated Rho-dependent cell rounding in MDA-MB 231 breast cancer cells expressing activated Gα12. These data suggest that Gα12 binds to the RGS domain of axin in a manner similar to that in which it interacts with the RGS domain of p115RhoGEF. Materials. Gα12 and Gα13 antibodies were purchased from Santa Cruz Biotechnology (Santa Cruz, CA), Gαq antibody was a gift of Tom Gettys (Pennington Biomedical Research Center, Baton Rouge, LA), and Gαi antibody (p960) was described previously (Mumby and Gilman, 1991). The anti-axin rabbit polyclonal antibody and the anti-myc M2 monoclonal antibody were both purchased from Zymed (South San Francisco, CA), and the M1 anti-FLAG mouse monoclonal antibody was purchased from Sigma-Aldrich (St. Louis, MO). The anti-GFP antibody was purchased from Roche (Indianapolis, IN). Plasmid Constructs. cDNAs encoding all Gα forms used in this study, including mutationally activated (QL) and wild-type (WT) forms, were obtained from the Guthrie Research Institute (now the UMR cDNA Research Center, Rolla, MO). GFP-axinΔDIX, which encodes a fusion between green fluorescent protein (GFP) and axin lacking residues 873 to 956, was kindly provided by Harold Varmus (Sloan-Kettering Institute, NewYork, NY) and myc-p115RGS by Tohru Kozasa (University of Illinois, Chicago, IL). Two axin RGS-containing sequences were created by PCR: axinRGS (residues 81-502) and axinRGSa (residues 83-211). The domains were subcloned into pGEX-KG and pGEX5X-1 vectors (Pharmacia, Peapack, NJ), respectively, between EcoRI and HindIII for GST-axinRGS and BamHI and EcoRI for GST-axinRGSa. The pcDNA 3.1 plasmid was purchased from Invitrogen (Carlsbad, CA) and the pEGFP plasmid was purchased from Clontech (Mountain View, CA). Protein Purification. GST fusion proteins used in Gα12 binding experiments (GST-axinRGS, GST-axinRGSa, GST-p115, and GST alone) were made in the BL21DE3 strain of Escherichia coli (Novagen, La Jolla, CA). In brief, transformed bacterial colonies containing the indicated constructs were inoculated into 10 ml of media and grown overnight. After 16 h, the small cultures were used to inoculate 500 ml of media and grown at 37°C for 2 to 3 h until the optical density reached 0.5 to 0.6. At this point, the cells were induced with 0.5 mM isopropyl-d-thiogalactopyranoside (Teknova) and cultures were grown for an additional 2.5 h at 37°C. The cells were harvested by centrifugation at 6000g for 15 min, and the resulting pellet was resuspended in 2.5 ml of buffer A (2.3 M sucrose, 50 mM Tris-HCl, pH 7.7, 1 mM EDTA, and a mix of protease inhibitors: 23 μg/ml phenylmethylsulfonyl fluoride, 11 μg/ml l-1-tosylamido-2-phenylethyl chloromethyl ketone, and 11 μg/ml 1-chloro-3-tosylamido-7-amino-2-heptanone) followed by dilution with 10 ml of buffer B (50 mM Tris-HCl, pH 7.7, 10 mM KCl, 1 mM EDTA, 1 mM DTT, and mix of protease inhibitors). The cells were then passed three times at 10,000 p.s.i. through a microfluidizer (Microfluidics Corporation, Newton, MA). Cell lysates were cleared by centrifugation at 30,000g for 30 min at 4°C, and the resulting supernatants were incubated with glutathione-Sepharose 4B beads (Amersham Biosciences, Piscataway, NJ) with continuous rocking for 2 h. Beads with bound GST protein were washed with buffer B, and the protein was eluted from the beads by incubation in 50 mM HEPES and 20 mM reduced glutathione three times for 10 min each at 21°C. The eluent was then dialyzed into 50 mM HEPES, 1 mM EDTA, and 1 mM DTT and stored at -80°C. Recombinant Gα12 and Gα13 were prepared by infecting Sf9 cells with baculovirus directing expression of the respective Gα, Gβ1, and hexahistidine-tagged Gγ2, and Gα subunits so produced were purified as described previously (Kozasa and Gilman, 1995; Kozasa et al., 1998). Recombinant Gαz was expressed in E. coli and purified as described previously (Casey et al., 1990), and a mixture containing Gαi/o was purified from bovine brain as described previously (Sternweis and Robishaw, 1984). Cell Culture and Transfection. HEK293T cells were obtained from the American Type Culture Collection (Manassas, VA) and grown in Dulbecco's modified Eagle's medium, 10% fetal bovine serum. Transfections were performed using LipofectAMINE2000 (Life Technologies, Inc., Gaithersburg, MD) according to the manufacturer's instructions. MDA-MB 231 cells were obtained from the American Type Culture Collection and cultured in Dulbecco's modified Eagle's medium with 10% FBS and 10 μg/ml insulin. In Vitro Binding Assays. HEK293T cells were grown to 90% confluence on 10-cm plates and transfected with pcDNA3.1-Gα12QL, pcDNA3.1-Gα13QL, pcDNA3.1-GαqQL, or pcDNA3.1-Gαi1QL. After 36 h, cells were rinsed in ice-cold PBS and lysed in 0.4 ml of lysis buffer [50 mM HEPES, pH 8, 105 mM NaCl, 1 mM EDTA, 1 mM DTT, 5 mM MgSO4, 1% polyoxyethylene 10 laurel ether (LPX)] and a protease inhibitor mix. The lysate was transferred to a 1.5-ml tube and rocked at 4°C for 1 h, then centrifuged at 16,000g for 10 min at 4°C. Cleared lysates were diluted 1:10 with dilution buffer [1% casamino acids (Fisher Scientific, Hampton, NH), 50 mM HEPES, pH 8, 105 mM NaCl, 1 mM EDTA, 1 mM DTT, 5 mM MgSO4, and protease inhibitors] and rocked at 4°C with 350 pmol of purified GST-axinRGS, GST-p115RGS, or GST protein for 1 h. Forty microliters of glutathione Sepharose 4B beads (Amersham Biosciences) equilibrated in dilution buffer were then added to each mixture and incubated with rocking at 4°C for an additional 2 h. The beads were then washed three times with 150 μl of a buffer consisting of 50 mM HEPES, pH 8, 105 mM NaCl, 1 mM EDTA, 1 mM DTT, 5 mM MgSO4, 0.05% LPX, and protease inhibitors, and precipitated material was separated by SDS-PAGE and analyzed by immunoblot for the presence of the various G proteins. Direct Binding Assays. Purified G protein α subunits were loaded with [γ-35S]GTP essentially as described previously (Meigs et al., 2001). Purified Gαi/o and Gαz proteins were incubated in loading buffer (5 μM[γ-35S]GTP, 50 mM HEPES, pH 8.0, 1 mM EDTA, 1 mM DTT, 0.05% LPX, and 5 mM MgSO4) for 30 min at 21°C. Gα12 and Gα13 were incubated in loading buffer supplemented with 100 mM ammonium sulfate for 1 h at 30°C. The loaded G proteins were then filtered through a 1-ml G50 Sephadex (Pharmacia) spin column for 3 min at 200g at 4°C. GTPγS-loaded G proteins were quantified by scintillation spectroscopy, and equal amounts of active protein (1 pmol) were incubated with gentle rocking along with 70 pmol of the indicated purified GST proteins in loading buffer with 1% (w/v) casamino acids in a volume of 200 μl for 2 h at 4°C. Thirty microliters of glutathione Sepharose beads equilibrated in loading buffer were then added to the incubation and rocked for an additional2hat 4°C. Finally, glutathione Sepharose 4B beads (Amersham Biosciences) were washed three times with 150 μl of loading buffer and analyzed by scintillation spectroscopy. Axin constructs. Schematic illustrations of axin constructs used in the study. Known binding axin partners are indicated above the appropriate domain binding site. A, full-length axin; B, GFP-AxinΔDIX; C, GST-axin-RGS; D, GST-axinRGSa. Coimmunoprecipitation Assays. HEK293T cells were grown to 90% confluence on 10-cm plates and transfected with GFP-axinΔDIX or GFP vector alone along with the indicated Gα constructs. The transfected cells were incubated at 37°C for 36 h, washed on ice with ice-cold PBS, and lysed in 0.5 ml of ice-cold lysis buffer (20 mM HEPES, pH 8, 1 mM EDTA, 2 mM MgCl2, 150 mM NaCl, 2% Triton X-100, and protease inhibitors). The lysate was rocked at 4°C for 1 h, diluted 1:1 with dilution buffer (20 mM HEPES, pH 8, 1 mM EDTA, 2 mM MgCl2, and 150 mM NaCl) and centrifuged at 100,000g for 1 h. The protein concentration of the supernatant was measured, and equal amounts of protein were incubated for 16 h at 4°C with 2 μg of anti-GFP antibody and 50 μl of protein A/G Sepharose 4 Fastflow (Amersham Biosciences) 1:1 mixture equilibrated in dilution buffer. Immune complexes were precipitated by centrifugation for 3 min at 200g and washed three times with 1 ml of wash buffer containing 1% Triton X-100. The samples were then processed by SDS-PAGE and immunoblot analysis to detect bound proteins. Cell Rounding Assay. MDA-MB 231 cells were seeded at a density of 150,000 cells per dish on 22-mm sterile glass coverslips (VWR Scientific, West Chester, PA) that had been coated for 2 h at 37°C with 5 μg/ml fibronectin (Sigma-Aldrich) and rinsed with PBS. After 24 h of growth on the coverslips, the cells were infected with adenoviruses directing expression of GFP and Gα12(QL), Gα13(QL), p115RGS, axinRGS, axinΔDIX, or GFP alone as indicated in the figure legend. Infections were allowed to proceed for 5 h, and then cells were serum-starved for 18 h. To visualize the actin cytoskeleton, the cells washed twice with PHEM buffer (60 mM PIPES, pH 6.9, 25 mM HEPES, pH 7, 10 mM EGTA, and 4 mM MgSO4) and fixed in 4% paraformaldehyde/PHEM for 20 min at 37°C. The cells were then washed twice more with PHEM buffer and then permeabilized in 0.2% Triton X-100/PHEM for 5 min at room temperature. Next, the cells were washed three times for 5 min in 0.1% Triton X-100/PHEM and then incubated for 45 min at 37°C in 10% goat serum/PHEM. The coverslips were incubated cell-side-down on parafilm for 10 min with 100 μl of rhodamine/phalloidin (5 μg/ml in 5% goat serum/PHEM; Sigma-Aldrich) and then washed three times for 5 min in 0.1% Triton X-100/PHEM. Finally, the cells were washed once for 5 min in PHEM containing 10 μg/ml Hoechst 33342 (Molecular Probes, Eugene, OR) and washed once more in H2O. Slides were mounted (0.01% p-phenylenediamine in 0.1× PBS and 90% glycerol) and visualized using an Eclipse TE300 inverted microscope (Nikon, Tokyo, Japan). Axin Specifically Binds Gα12 in Vitro. Previous studies have shown that members of the G12 subfamily of heterotrimeric G proteins are able to influence the fate of β-catenin by interacting with cadherins at the cell surface, resulting in compromised binding of cadherin to β-catenin (Meigs et al., 2001, 2002). Given this link between G12 proteins and β-catenin and the existence of the RGS domain on the β-catenin regulator axin, we tested the ability of the two closely related G12 family members, Gα12 and Gα13, to bind the axin RGS domain. We expressed QL forms of Gα12 and Gα13, which are unable to efficiently hydrolyze GTP, in HEK293 cells, and the cell lysates incubated with GST-axinRGS (see Fig. 1) or p115RGS, the latter being the RGS domain from a protein known to interact with both G12 family members (Kozasa et al., 1998). Complexes so formed were precipitated and G proteins bound to the RGS domains detected by immunoblot analysis. As expected, GST-p115RGS robustly precipitated both Gα12 and Gα13 from the cell lysates (Fig. 2A). It is noteworthy that GST-axinRGS precipitated Gα12, but not the closely related Gα13, from the lysates (Fig. 2A). To further assess the specificity of the interaction between the RGS domain of axin and Gα12, WT and QL forms of Gα subunits representing two other G protein subfamilies (Gαq and Gαi2) were also expressed in HEK293 cells, and the lysates were subjected to the precipitation experiment described above. Gα12 bound to axinRGS in an activation-sensitive manner, whereas neither Gαq nor Gαi2 bound GST-axinRGS at levels above their background binding to GST (Fig. 2B). AxinRGS specifically binds mutationally activated Gα12. A, lysates from 10-cm plates of 90% confluent HEK293 cells expressing QL forms of Gα12 and Gα13 were prepared as described under Materials and Methods. One tenth of the lysate from each plate was diluted and incubated with 350 pmol of either GST, GST-axinRGS, or GST-p115RGS, as indicated in the figure, for 1 h at 4°C. Complexes were precipitated with glutathione-Sepharose beads, and the pellets were processed by SDS-PAGE for immunoblot analysis with anti-Gα12 antisera (left) or anti-Gα13 antisera (right). The data are from a single experiment that is representative of at least three separate experiments. B, lysates from HEK293 cells expressing the indicated Gα proteins [either WT (left) or QL (right)] were prepared and incubated with 350 pmol of purified GST or GST-axinRGS as above. Complexes were precipitated with glutathione-Sepharose beads, and the pellets were processed by SDS-PAGE for immunoblot analysis with anti-Gα12, anti-Gαq, or anti-Gαi2 antisera as indicated in the figure. The data are from a single experiment that is representative of at least three separate experiments. C, G protein α subunits were purified as described under Materials and Methods. The [35S]GTPγS-loaded G protein indicated in the figure (5 nM) was incubated with either GST or GST-axinRGSa (350 nM each) for 2 h at 4°C. Complexes were precipitated with glutathione-Sepharose beads, and the pellets were analyzed by scintillation spectroscopy. Each bar depicts the mean of two separate determinations from a single experiment for each G protein and is representative of at least two separate experiments. To assess whether the observed interaction between axin and Gα12 was direct, we used purified G proteins in binding experiments with a minimal GST-tagged axin RGS domain (GST-axinRGSa; see Fig. 1). Gα subunits were loaded with [35S]GTPγS and incubated with an excess of purified GST-axinRGSa. Protein complexes were precipitated with glutathione-Sepharose beads, and the presence of bound G proteins was analyzed by scintillation spectroscopy. In agreement with the data shown in Fig. 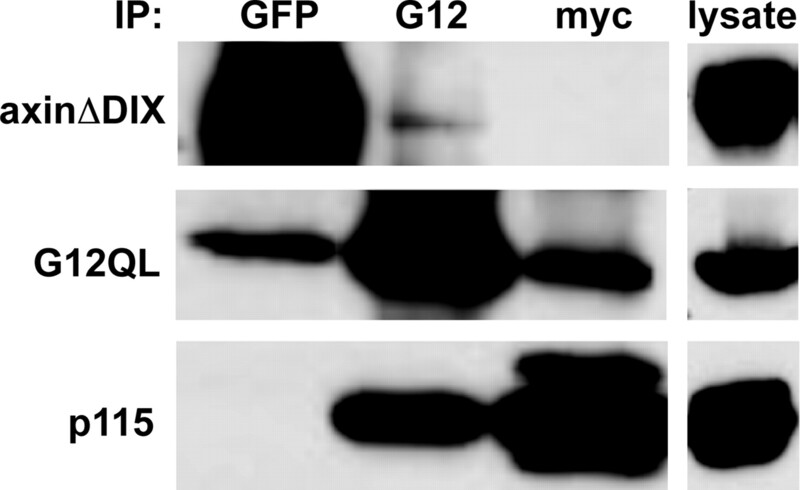 2, A and B, this experiment revealed substantial binding of the RGS domain of axin to Gα12 but not to Gα13, Gαz, or a mix of Gi and Go proteins (Gαi/o) (Fig. 2C). As expected, Gα12 and Gα13 both bound GST-p115, and Gz and Gi/o both bound the RGS protein Gα interacting protein (data not shown). Although axin has been reported to bind the activated form of Gαs (Castellone et al., 2005), we were unable to detect significant binding of Gαs to either GST-axinRGS or GST-axinRGSa beyond its binding to GST alone (data not shown). Axin and Gα12 Interact in Cells. Having obtained evidence that the RGS domain of axin and Gα12 interact in vitro, we further analyzed this interaction using coimmunoprecipitation experiments in which a modified form of axin termed axinΔDIX was used. The ΔDIX construct is missing the C-terminal, self-associating DIX domain, which, if present, causes the formation of large intracellular aggregates upon overexpression (Cong and Varmus, 2004). The GFP-axinΔDIX construct (see Fig. 1) was coexpressed in HEK293T cells with mutationally activated Gα subunits representing three G protein subfamilies (Gα12QL/Gα13QL, GαqQL, and GαoQL). The cells were lysed and axinΔDIX immunoprecipitated with anti-GFP antibody. As shown in Fig. 3A, axinΔDIX bound specifically to Gα12 but not Gα13, Gαq, or Gαo. The reciprocal experiment was also performed, in which the complexes were immunoprecipitated with anti-Gα12 or anti-Gα13 antibodies. Again, a specific interaction between axin and Gα12, but not Gα13, was detectable by immunoblot (Fig. 3B). The lower band of the doublet seen in the GFP blots seems to be a cross-reacting protein found in the absence of GFP-axinΔDIX expression. G proteins can act as molecular switches, existing in either the GTP-bound “on” state or the GDP-bound “off” state. Therefore, many interactions between G proteins and their binding partners are dependent on the activation state of the G protein. RGS proteins typically show preferential binding to the activated form of G proteins (Tesmer et al., 1997). To test the activation preference of the axin-Gα12 interaction, wild-type and QL Gα12 constructs were expressed with GFP-axinΔDIX in HEK293T cells, and complexes were immunoprecipitated with anti-GFP antibody. Using this technique, an interaction between axin and the activated form of Gα12 was observed, but little wild-type Gα12 bound to axin (Fig. 3C, left). Immunoprecipitation with anti-G12 antibody produced the complementary result; i.e., axin preferentially bound the activated form of Gα12 (Fig. 3C, right). Assessment of a Functional Consequence of the Axin-Gα12 Interaction. RGS proteins typically selectively bind the activated form of G proteins and act as GTPase activating proteins (GAPs). To assess the possibility that axin may act as a GAP for Gα12, we performed single-turn-over GTPase activity assays using purified recombinant proteins. In these experiments, we determined that Gα12 hydrolyzes GTP at 0.12 min-1 at 21°C (data not shown), a rate significantly faster than had been originally estimated (Kozasa and Gilman, 1995) but consistent with rates extrapolated from other subsequent reports (Kozasa et al., 1998). In any event, the presence of axin, even at concentrations greater than a 50-fold molar excess relative to Gα12, did not significantly increase the GTP hydrolytic activity of Gα12, despite the fact that the protein readily bound to Gα12 (Figs. 2 and 3). In contrast, p115RGS was able to stimulate G12 GTPase activity by 3- to 5-fold (data not shown). Axin specifically coimmunoprecipitates with the activated form of Gα12. Ten-centimeter plates of 90% confluent HEK293T cells were transfected with the indicated plasmids, and whole-cell lysates were harvested after 24 h as described under Materials and Methods. A, Gα12 coimmunoprecipitates with axin. Cleared lysates from each 90% confluent plate were incubated for 16 h at 4°C with protein A/G-Sepharose bead mix (1:1) and anti-GFP antisera (i.e., to precipitate GFP-axinΔdix). Beads were washed, and bound proteins were processed by SDS-PAGE for immunoblot analysis with either anti-Gα12, anti-Gα13, anti-Gαq, or anti-Gαo antibodies, as indicated in the figure. Lysates not subjected to immunoprecipitation were analyzed by immunoblot using the antisera indicated (bottom). B, axin coimmunoprecipitates with Gα12. Cell lysates were incubated for 16 h at 4°C with protein A/G-Sepharose bead mix (1:1) and either anti-Gα12 or anti-Gα13 antisera, as indicated in the figure. Beads were washed, and bound proteins were processed by SDS-PAGE for immunoblot analysis with anti-GFP antisera to detect GFP-axinΔdix (arrow). Lysates not subjected to immunoprecipitation were analyzed by immunoblot using the antisera indicated (bottom). C, axin preferentially binds the activated form of Gα12. Cleared lysates were incubated for 16 h at 4°C with protein A/G Sepharose mix (1:1) and either anti-GFP antisera (left) or anti-Gα12 antisera (right). Beads were washed, and bound proteins were processed by SDS-PAGE for immunoblot analysis with anti-GFP antisera or anti-Gα12 antisera as indicated in the figure. Lysates not subjected to immunoprecipitation were analyzed by immunoblot using the antisera indicated (bottom). Data shown is representative of at least two separate experiments. To test whether axinRGS can influence G12 signaling by competing with downstream effectors, we examined the effect of axin on G12-dependent activation of the small G protein RhoA. The two members of the G12 subfamily of G proteins (Gα12 and Gα13) activate Rho through a group of adapter proteins, including p115RhoGEF, PDZ-RhoGEF, and LARG, that contain both an RGS domain and a Dbl homology domain that promotes guanine nucleotide exchange in Rho (Hart et al., 1998b; Fukuhara et al., 2001). Because Rho is important for regulating actin cytoskeletal rearrangements (Hall, 1998), in some cell types, G12-mediated Rho activation is manifest by the cells exhibiting a rounded phenotype (Meigs et al., 2005). Using adenoviral vectors, expression of mutationally activated forms of both Gα12 and Gα13 induced significant rounding in MDA-MB 231 breast cancer cells (Fig. 4A, left), whereas expression of GFP alone had no effect (data not shown). As has been reported previously (Meigs et al., 2005), coexpression of p115RGS prevented both Gα12- and Gα13-stimulated rounding (Fig. 4A). In contrast, and in complete agreement with the binding data, coexpression of either axinRGS or axinΔDIX prevented rounding (Fig. 4A), peripheral stress fiber formation, and accumulation (Fig. 4B) in cells expressing Gα12 but had little effect on cells expressing Gα13. Infection efficiency was essentially 100%, and immunoblot analysis confirmed that expression of the G proteins was not affected by coexpression of the RGS-containing constructs (data not shown). The axin-mediated inhibition of G12-stimulated cell rounding (Fig. 4, A and B) was quantified by manually scoring cell morphology in random microscopic fields. As shown in Fig. 4C, expression of either axinRGS or axinΔdix inhibited G12-stimulated rounding by at least 50% but had no significant effect on G13-stimulated rounding. 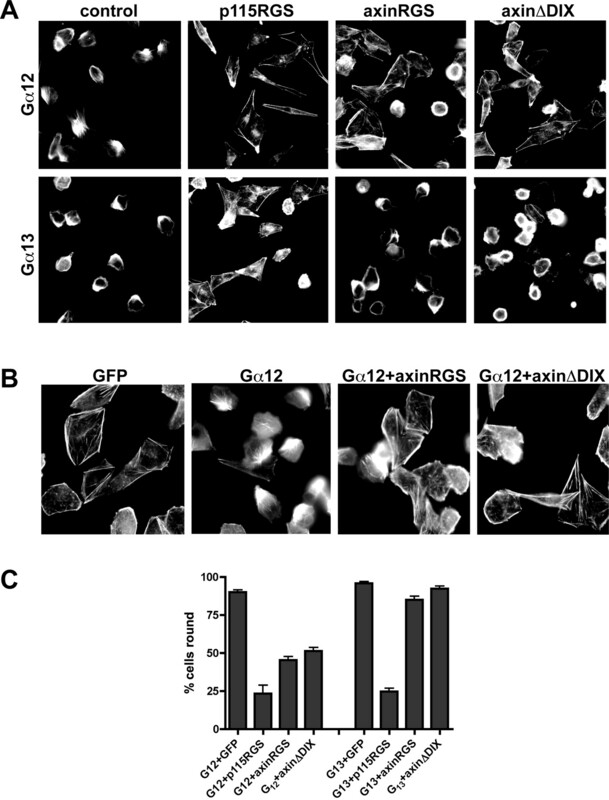 Thus, the RGS domain of axin can not only bind Gα12 but also modulate Gα12 signaling. The mechanism of the axin-mediated blockade of cell rounding potentially involves inhibition of the Gα12-p115RhoGEF interaction. The structure of the RGS domain of axin (Spink et al., 2000) and the corresponding domain of p115RhoGEF (Chen et al., 2001) are quite similar, and we therefore predicted that the two domains would bind Gα12 in a similar manner. To test this hypothesis, p115RGS and axinRGS were coexpressed with Gα12QL, and coimmunoprecipitation experiments were performed to assess Gα12 binding to axin and p115 in the context of both RGS-class proteins being present in the mixture. As shown in Fig. 5, immunoprecipitation of axin resulted in coprecipitation of Gα12 but not p115 (Fig. 5, lane 1); immunoprecipitation of p115RGS resulted in coprecipitation of Gα12 but not axin (Fig. 5, lane 3); immunoprecipitation of Gα12 resulted in coprecipitation of both axin and p115RGS (Fig. 5, lane 2). Hence, in cells, Gα12 binding to these two RGS proteins is mutually exclusive. While the manuscript for this article was being prepared, only one subfamily of RGS proteins, the axin/conductin group, had not been reported to associate with heterotrimeric G proteins. The primary member of this subfamily, axin, is the major negative regulator of the Wnt pathway and functions by acting as a scaffold that assembles the complex of proteins necessary for continuous degradation of cytosolic β-catenin (Hart et al., 1998a; Kishida et al., 1998, 1999; Hamada et al., 1999; Hinoi et al., 2000). A report appeared recently demonstrating an interaction between the axin RGS domain and the heterotrimeric G protein Gαs (Castellone et al., 2005). In this study, we provide the first evidence of a direct interaction between axin and a member of the G12 family of G proteins. The interaction was specific for Gα12 relative to Gα13, and, consistent with other RGS-containing proteins, axin preferentially bound to the activated form of Gα12. We did not detect a significant in vitro interaction between Gαs and axinRGS (data not shown). The reason for this is not completely clear, but it may related to the use of slightly different axinRGS constructs. In addition, one of our methods of identifying RGS-G protein interactions used the GTPγS-bound form of G proteins (Fig. 2C). In Castellone et al., axin did not significantly bind Gαs-GTPγS. AxinRGS prevents Gα12-induced cell rounding in MDA-MB 231 breast cancer cells. A, MDA-MB 231 cells (1.5 × 105) were plated on fibronectin-coated glass coverslips. After 24 h, cells were infected with the adenoviruses directing expression of GFP plus the indicated proteins for 5 h as described under Materials and Methods and serum-starved for 18 additional h. Infection efficiency was essentially 100%. The cells were then fixed and stained with rhodamine-phalloidin to visualize the cell shape and the actin cytoskeleton using an inverted fluorescence microscope (40× objective). The data shown are representative fields from a single experiment that is representative of 3 separate experiments. B, high magnification (60× objective) images of 231 cells (grown, fixed, and stained as described above) showing stress fiber formation and morphology under conditions of adenovirally expressed GFP, Gα12(QL), Gα12(QL)+axinRGS, or Gα12(QL)+axinΔDIX as indicated in the figure. The data shown are representative fields from a single experiment that is representative of three separate experiments. C, the effect of expression of the indicated axin constructs on Gα12- and Gα13-stimulated MDA-MB 231 cell rounding (as shown in A) was quantified by counting rounded cells in five random microscopic fields (40× objective) from each condition indicated. The bars indicate the mean percentage of rounded cells. Data are representative of at least three separate experiments. It is notable that axin had little effect on the rate of Gα12 GTP hydrolysis in in vitro GTPase assays. The lack of significant GAP activity for axinRGS is not without precedent among RGS proteins. The N terminus of GRK2 contains an RGS domain that selectively binds activated forms of members of the Gq family of G proteins. GRK2 lacks significant GAP activity but is able to down-regulate Gq-mediated signaling, presumably by sequestering and/or competing with effectors (Carman et al., 1999). In an analogous fashion, axin was able to down-regulate G12 signaling; expression of the axin RGS domain in MDA-MB 231 breast cancer cells specifically blocked G12 signaling in these cells and protected them from G12-stimulated rounding. A possible mechanism for the blockade of Gα12 signaling by ectopic expression of axinRGS is an inhibition of the G12-p115RhoGEF interaction, which is one pathway that activates Rho in these cells (Meigs et al., 2005). The structure of the RGS domain of axin (Spink et al., 2000) and the corresponding domain of p115RhoGEF are quite similar, and we would predict that the two domains bind Gα12 in a similar manner. Indeed, when G12, axin, and p115 were coexpressed in cells and complex formation assessed by coimmunoprecipitation experiments, we observed nonoverlapping binding of axin and p115 to G12; i.e., the binding of these two RGS-containing proteins to Gα12 was mutually exclusive. AxinRGS competes with p115RGS for Gα12 binding in HEK293T cells. Ten-centimeter plates of 90% confluent HEK293T cells were transfected with plasmids encoding GFP-axinΔdix, Gα12QL, and myc-p115RGS. Cell lysates were harvested after 24 h as described under Materials and Methods, and cleared lysates were incubated for 16 h at 4°C with protein A/G-Sepharose bead mix (1:1) and either anti-GFP (lane 1), anti-Gα12 (lane 2), or anti-myc (lane 3) antisera. Beads were washed, and bound proteins were processed by SDS-PAGE for immunoblot analysis with anti-GFP (to detect axin), anti-Gα12, and anti-myc (to detect p115RGS) antisera. Lysates not subjected to immunoprecipitation were analyzed by immunoblot using the antisera indicated (lane 4). Data shown are from a single experiment that is representative of three separate experiments. The significance of the interaction between G12 and axin remains to be fully elucidated. The G12 knockout mice created by Gu et al. (2002) have thus far revealed no overt phenotypic abnormalities beyond embryonic lethality, so there is no evidence in that system to suggest an impact of G12 on axin function. Germline axin loss-of-function mutations are known to cause a number of developmental defects, including axis duplication, neuroectodermal abnormalities, malformation of the head, and embryonic lethality in homozygotes (Zeng et al., 1997). There has been no reported evidence of unregulated G12 signaling in the mice with these mutations, though this possibility has not been thoroughly examined in the literature. Targeted disruption in the mouse of the closely related axin2, which similarly interacts with G12 (L. Stemmle and T. Fields, unpublished observations), results in premature ossification of the calvarium, a pheno-type resembling human craniosynostosis (Yu et al., 2005). The defects in the axin2 knockout mice seemed to be largely attributable to an effect on wnt signaling, though potential impact on other pathways was not tested (Yu et al., 2005). One noteworthy report demonstrated that osteoblasts from a form of craniosynostosis overexpress RhoA, an important downstream target of G12 (Lomri et al., 2001). However, RhoA and G12 activity were not examined in this study. Thus, there is no clear evidence in mice connecting G12 and axin, although the hypothesis has not been formally assessed. 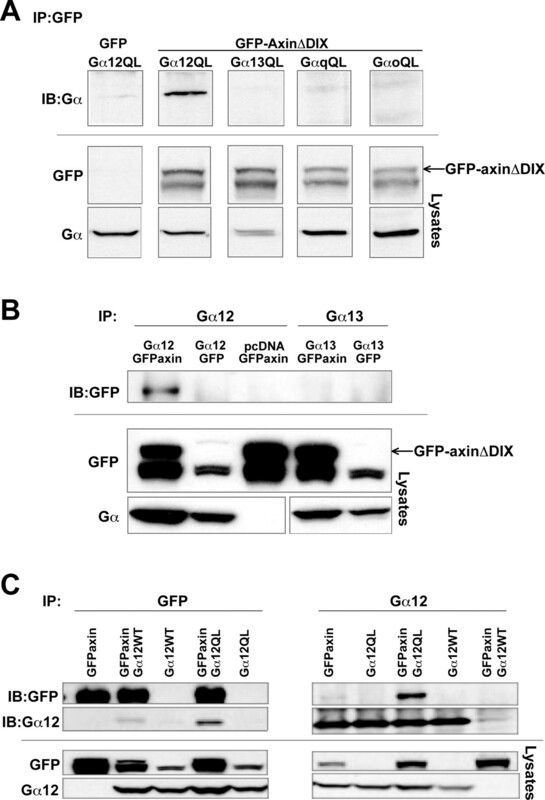 Nevertheless, the axin-G12 interaction may provide a unique approach to specifically inhibiting Gα12-mediated signaling pathways and distinguishing them from Gα13 activated processes. Furthermore, as work in this field continues, it will be important to determine whether axin can also serve as an effector of Gα12 to regulate the Wnt signaling pathway. Exploration of the cross-talk between G12 and axin signaling could provide significant insight into our under-standing of the complex regulation of these two important pathways. We thank A. Nixon, T. Meigs, D. Kaplan, J. Juneja, P. Kelly, and A. Embry for helpful discussions. This work was supported by National Institutes of Health grant CA100869 (to P.J.C.) and the National Institutes of Health Clinical Scientist Development Award DK62833 (to T.A.F.). L.N.S. and T.A.F. contributed equally to this work. ABBREVIATIONS: GPCR, G protein-coupled receptor; RGS, regulator of G protein signaling; APC, adenomatous polyposis coli; RhoGEF, Rho guanine nucleotide exchange factor; QL, mutationally activated Gα form; WT, wild-type; GFP, green fluorescent protein; DTT, dithiothreitol; GST, glutathione transferase; HEK, human embryonic kidney; LPX, polyoxyethylene 10 laurel ether; PAGE, polyacrylamide gel electrophoresis; GTPγS, guanosine 5′-O-(3-thio)triphosphate; PIPES, piperazine-N,N′-bis(2-ethanesulfonic acid); PHEM, PIPES/HEPES/EGTA/MgSO4; PBS, phosphate-buffered saline; GAP, GTPase-activating protein. Berman DM, Wilkie TM, and Gilman AG (1996) GAIP and RGS4 are GTPase-activating proteins for the Gi subfamily of G protein alpha subunits. Cell 86: 445-452. Cabrera-Vera TM, Vanhauwe J, Thomas TO, Medkova M, Preininger A, Mazzoni MR, and Hamm HE (2003) Insights into G protein structure, function, and regulation. Endocrine Rev 24: 765-781. Carman CV, Parent JL, Day PW, Pronin AN, Sternweis PM, Wedegaertner PB, Gilman AG, Benovic JL, and Kozasa T (1999) Selective regulation of Gαq/11 by an RGS domain in the G protein-coupled receptor kinase, GRK2. J Biol Chem 274: 34483-34492. Casey PJ, Fong HK, Simon MI, and Gilman AG (1990) Gz, a guanine nucleotide-binding protein with unique biochemical properties. J Biol Chem 265: 2383-2390. Castellone MD, Teramoto H, Williams BO, Druey KM, and Gutkind JS (2005) Prostaglandin E2 promotes colon cancer cell growth through a Gs-axin-beta-catenin signaling axis. Science (Wash DC) 310: 1504-1510. Chen Z, Wells CD, Sternweis PC, and Sprang SR (2001) Structure of the rgRGS domain of p115RhoGEF. Nat Struct Biol 8: 805-809. Choi J, Park SY, Costantini F, Jho EH, and Joo CK (2004) Adenomatous polyposis coli is down-regulated by the ubiquitin-proteasome pathway in a process facilitated by Axin. J Biol Chem 279: 49188-49198. Cong F and Varmus H (2004) Nuclear-cytoplasmic shuttling of Axin regulates subcellular localization of beta-catenin. Proc Natl Acad Sci USA 101: 2882-2887. Fukuhara S, Chikumi H, and Gutkind JS (2001) RGS-containing RhoGEFs: the missing link between transforming G proteins and Rho? Oncogene 20: 1661-1668. Gu JL, Muller S, Mancino V, Offermanns S, and Simon MI (2002) Interaction of G alpha(12) with G alpha(13) and G alpha(q) signaling pathways. Proc Natl Acad Sci USA 99: 9352-9357. Hall A (1998) Rho GTPases and the actin cytoskeleton. Science (Wash DC) 279: 509-514. Hamada F, Tomoyasu Y, Takatsu Y, Nakamura M, Nagai S, Suzuki A, Fujita F, Shibuya H, Toyoshima K, Ueno N, et al. (1999) Negative regulation of Wingless signaling by D-axin, a Drosophila homolog of axin. Science (Wash DC) 283: 1739-1742. Hart MJ, de los Santos R, Albert IN, Rubinfeld B, and Polakis P (1998a) Down-regulation of beta-catenin by human Axin and its association with the APC tumor suppressor, beta-catenin and GSK3 beta. Curr Biol 8: 573-581. Hart MJ, Jiang X, Kozasa T, Roscoe W, Singer WD, Gilman AG, Sternweis PC, and Bollag G (1998b) Direct stimulation of the guanine nucleotide exchange activity of p115 RhoGEF by Gα13. Science (Wash DC) 280: 2112-2114. Hinoi T, Yamamoto H, Kishida M, Takada S, Kishida S, and Kikuchi A (2000) Complex formation of adenomatous polyposis coli gene product and axin facilitates glycogen synthase kinase-3 β-dependent phosphorylation of β-catenin and down-regulates β-catenin. J Biol Chem 275: 34399-34406. Hollinger S and Hepler JR (2002) Cellular regulation of RGS proteins: modulators and integrators of G protein signaling. Pharmacol Rev 54: 527-559. Hunt TW, Fields TA, Casey PJ, and Peralta EG (1996) RGS10 is a selective activator of G alpha i GTPase activity. Nature (Lond) 383: 175-177. Kishida M, Koyama S, Kishida S, Matsubara K, Nakashima S, Higano K, Takada R, Takada S, and Kikuchi A (1999) Axin prevents Wnt-3a-induced accumulation of beta-catenin. Oncogene 18: 979-985. Kishida S, Yamamoto H, Ikeda S, Kishida M, Sakamoto I, Koyama S, and Kikuchi A (1998) Axin, a negative regulator of the wnt signaling pathway, directly interacts with adenomatous polyposis coli and regulates the stabilization of β-catenin. J Biol Chem 273: 10823-10826. Korinek V, Barker N, Morin PJ, van Wichen D, de Weger R, Kinzler KW, Vogelstein B, and Clevers H (1997) Constitutive transcriptional activation by a beta-catenin-Tcf complex in APC-/- colon carcinoma. Science (Wash DC) 275: 1784-1787. Kozasa T and Gilman AG (1995) Purification of recombinant G proteins from Sf9 cells by hexahistidine tagging of associated subunits. Characterization of α12 and inhibition of adenylyl cyclase by αz. J Biol Chem 270: 1734-1741. Kozasa T, Jiang X, Hart MJ, Sternweis PM, Singer WD, Gilman AG, Bollag G, and Sternweis PC (1998) p115 RhoGEF, a GTPase activating protein for Gα12 and Gα13. Science (Wash DC) 280: 2109-2111. Lomri A, Lemonnier J, Delannoy P, and Marie PJ (2001) Increased expression of protein kinase Calpha, interleukin-1alpha, and RhoA guanosine 5′-triphosphatase in osteoblasts expressing the Ser252Trp fibroblast growth factor 2 receptor Apert mutation: identification by analysis of complementary DNA microarray. J Bone Miner Res 16: 705-712. Meigs TE, Fedor-Chaiken M, Kaplan DD, Brackenbury R, and Casey PJ (2002) Gα12 and Gα13 negatively regulate the adhesive functions of cadherin. J Biol Chem 277: 24594-24600. Meigs TE, Fields TA, McKee DD, and Casey PJ (2001) Interaction of Galpha 12 and Galpha 13 with the cytoplasmic domain of cadherin provides a mechanism for beta-catenin release. Proc Natl Acad Sci USA 98: 519-524. Meigs TE, Juneja J, Demarco CT, Stemmle LN, Kaplan DD, and Casey PJ (2005) Selective uncoupling of Gα12 from Rho-mediated signaling. J Biol Chem. Mumby SM and Gilman AG (1991) Synthetic peptide antisera with determined specificity for G protein alpha or beta subunits. Methods Enzymol 195: 215-233. Munemitsu S, Albert I, Souza B, Rubinfeld B, and Polakis P (1995) Regulation of intracellular beta-catenin levels by the adenomatous polyposis coli (APC) tumor-suppressor protein. Proc Natl Acad Sci USA 92: 3046-3050. Nelson WJ and Nusse R (2004) Convergence of Wnt, beta-catenin, and cadherin pathways. Science (Wash DC) 303: 1483-1487. Ross EM and Wilkie TM (2000) GTPase-activating proteins for heterotrimeric G proteins: regulators of G protein signaling (RGS) and RGS-like proteins. Annu Rev Biochem 69: 795-827. Rubinfeld B, Tice DA, and Polakis P (2001) Axin-dependent phosphorylation of the adenomatous polyposis coli protein mediated by casein kinase 1epsilon. J Biol Chem 276: 39037-39045. Siderovski DP, Hessel A, Chung S, Mak TW, and Tyers M (1996) A new family of regulators of G-protein-coupled receptors? Curr Biol 6: 211-212. Spink KE, Polakis P, and Weis WI (2000) Structural basis of the Axin-adenomatous polyposis coli interaction. EMBO (Eur Mol Biol Organ) J 19: 2270-2279. Sternweis PC and Robishaw JD (1984) Isolation of two proteins with high affinity for guanine nucleotides from membranes of bovine brain. J Biol Chem 259: 13806-13813. Tesmer JJ, Berman DM, Gilman AG, and Sprang SR (1997) Structure of RGS4 bound to AlF4-activated G(i alpha1): stabilization of the transition state for GTP hydrolysis. Cell 89: 251-261. Watson N, Linder ME, Druey KM, Kehrl JH, and Blumer KJ (1996) RGS family members: GTPase-activating proteins for heterotrimeric G-protein alpha-subunits. Nature (Lond) 383: 172-175. Yu HM, Jerchow B, Sheu TJ, Liu B, Costantini F, Puzas JE, Birchmeier W, and Hsu W (2005) The role of Axin2 in calvarial morphogenesis and craniosynostosis. Development 132: 1995-2005. Zeng L, Fagotto F, Zhang T, Hsu W, Vasicek TJ, Perry WL III, Lee JJ, Tilghman SM, Gumbiner BM, and Costantini F (1997) The mouse Fused locus encodes Axin, an inhibitor of the Wnt signaling pathway that regulates embryonic axis formation. Cell 90: 181-192.